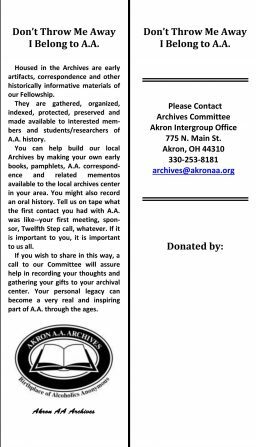 The Akron Area AA Archives has developed a new bookmark, hoping to remind everyone that their AA materials might have historical significance. The bookmark, which can be downloaded here, can be freely printed and distributed. You can help build our local collection by making your own early books, pamphlets, correspondence and related mementos available to the archives. You can also record an oral history by telling us what was like when you joined AA: your first meeting, sponsor, Twelfth Step call, etc. If it is important to you, it is important to us all! The above file contains four two-sided bookmarks that can be printed, cut apart and placed inside books and pamphlets to remind you of their potential importance to our local AA history. 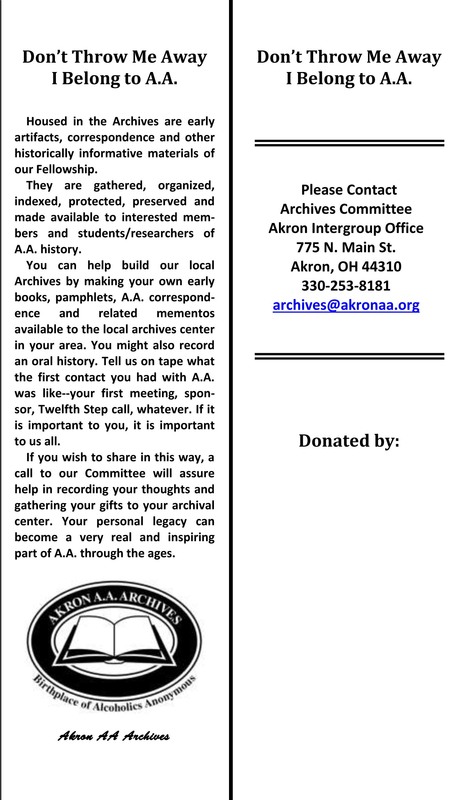 Bookmarks can also be picked up in the archives located at the Intergroup Office, 775 N. Main St., Akron OH 44310. Is Your Group Information Updated?